Northern Tablelands MP Adam Marshall and Acting Armidale Hospital Operations Manager Wendy Mulligan inspecting the enabling works which are currently underway to prepare the site for the main construction to begin in July on the $60 million Armidale Hospital redevelopment. WORK has formally commenced on the $60 million redevelopment of the Armidale Rural Referral Hospital. 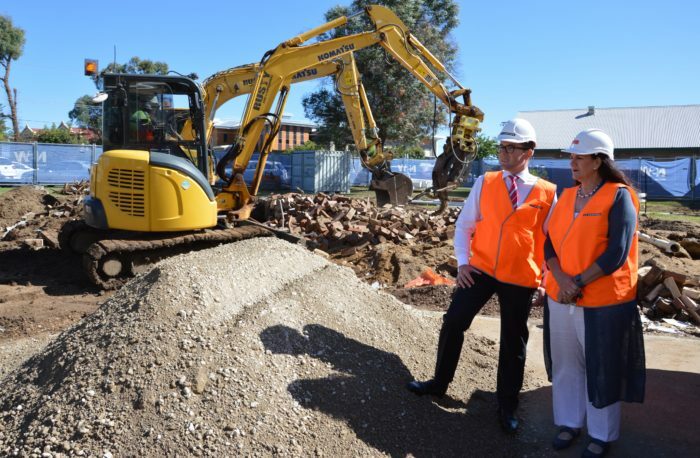 Northern Tablelands MP Adam Marshall was at the hospital today on the works site to witness the demolition of several buildings at the hospital, which will make way for a new four-storey structure. “This is a wonderful day for the Armidale community and one which has been long-anticipated,” Mr Marshall said. “This project has been hard-fought for by the community for many years but now it is a reality, with work underway to prepare the site for the main construction in July. Mr Marshall said the community will see a new and relocated emergency department to receive patients from O’Dell Street, new in-patient ward, four new operating theatres, a central sterilising supplies department and a new and expanded critical care unit. “Combined with the new University of New England Tablelands Clinical School and the impressive Ambulatory Care and Chemotherapy building, the redevelopment of Armidale Hospital will see a world-class health precinct in our region which combines extensive quality clinical and community health services with impressive teaching and research facilities,” he said. The state MP said that as part of the redevelopment enabling works underway the mortuary and former paediatrics buildings had been demolished, trees removed and the hospital’s electricity and plumbing services relocated and diverted around the worksite. “Asbestos is still being removed from the former infectious diseases ward building, built in 1911, and it’s scheduled to come down late next week with around 6,000 of its Armidale blue bricks being hand salvaged to be used in the construction of the new building,” he said. “This is a perfect way to blend the old with the new at the hospital and preserve the historical significance of the former buildings. Oxygen tanks will also be re-located and base construction of the new car park for the new emergency department entry will also be completed. “Major earthworks will also be undertaken and the site should be ready by the end of June for the main construction to start in July once contracts have been awarded,” Mr Marshall said. AW Edwards was awarded the contract to undertake the site preparation works with local Armidale plumbers and electricians used as part of the works. “I look forward to seeing the preparations works continue and will keep the community updated as we move closer to the main construction beginning,” Mr Marshall said.